Today’s card is part 6 in my series on the Stampin Up Petal Palette stamp set and Petals & More dies. It’s a beautiful color combination. The Rich Razzleberry and Old Olive Stampin Blends bring this to life. The Glitter Enamel dots and Pear Pizzaz Shimmer ribbon are not only yummy, they are the perfect accent. Designed by Angie Leach. Stamp the words in Sweet Sugarplum ink on Whisper White scrap. Using Memento Tuxedo Black ink, stamp the flower image on Whisper White Scrap paper. 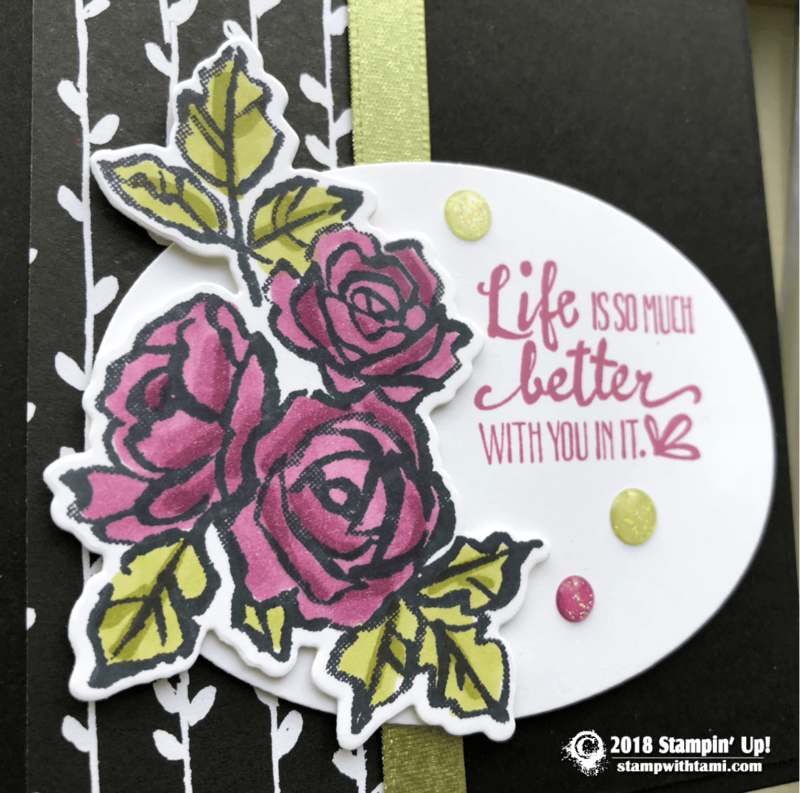 Color the flower with the Stampin Blends markers. (Click here for a video on how Stampin Blends Markers and how to use them). Using the Big Shot Die Cut Machine: Cut the flower and oval. Assembly: Assemble the card with Snail Adhesive, using Dimensionals on the oval panel and the flower panel. Attach Glitter Dots. 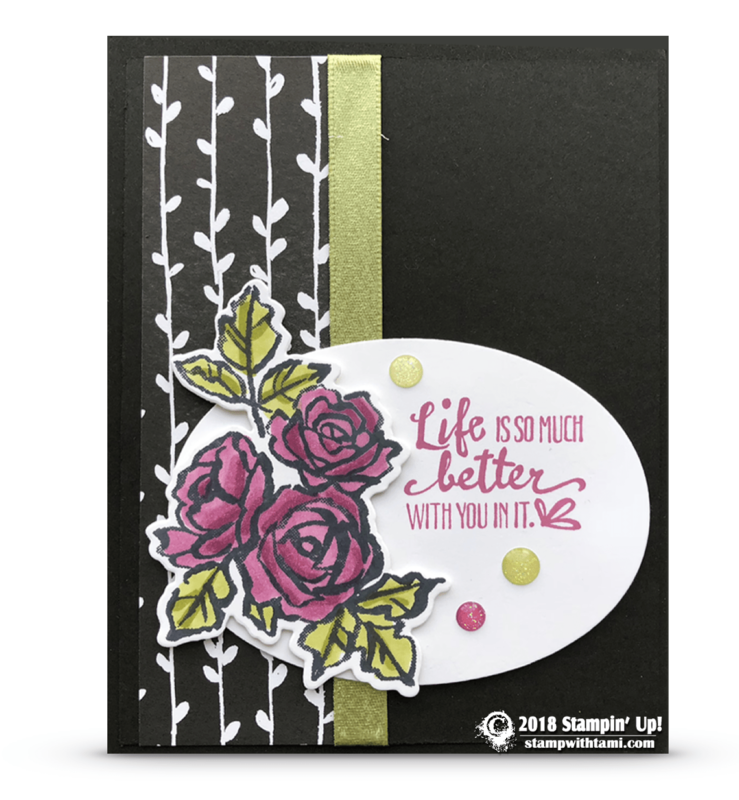 Measurements: Basic Black Card Base = 8-1/2″ x 5-1/2″, Basic Black Card Stock = 5-1/2″ x 4-1/4″, Petal Passion DSP: 5-1/4″ x 1-1/2″, and Whisper White scraps.